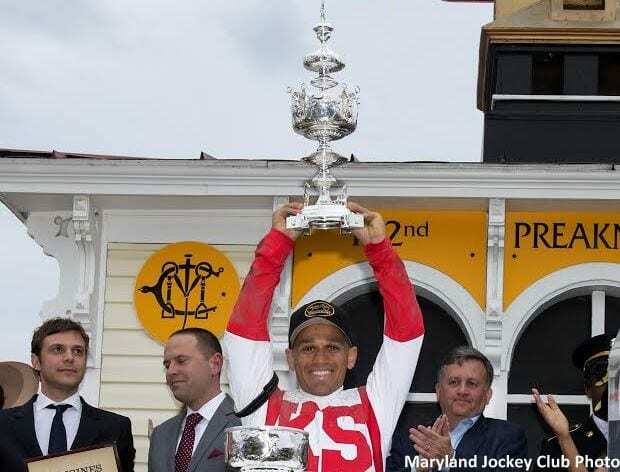 In a rare unanimous vote, Preakness Stakes winning jockey Javier Castellano was awarded Jockey of the Week honors for May 15 – 22, 2017. The award is voted on by a panel of experts for riding accomplishments by members of the Jockeys' Guild, the organization which represents more than 950 riders in North America. There will be no Triple Crown this year, but the excitement in the Pimlico stretch during this year's Preakness Stakes was the next best thing as Javier Castellano and the up-and-coming Cloud Computing engaged multiple graded stakes winner and champion 2-year-old colt Classic Empire in a duel down to the wire. Castellano and Cloud Computing just edged away from Julien Leparoux and Classic Empire, who had put away Kentucky Derby winner Always Dreaming earlier in the race. Cloud Computing ($28.80) gave trainer Chad Brown his first Preakness Stakes win. The colt was bred in Kentucky by Hill 'n' Dale Equine Holdings, Inc and Stretch Run Ventures, LLC and is owned by Klaravich Stables, Inc. and William Lawrence. This was Castellano's first race aboard the lightly-raced son of Maclean's Music. Castellano had already impressed prior to the Preakness and started in a remarkable 13 stakes races last week. The Preakness was his fourth stakes win of the weekend. Castellano's run began with a second-place finish on Carrumba in the $150,000 Allaire DuPont Distaff (G3) on Friday at Pimlico. Next, he started a three-race win streak with an allowance race and continued through two stakes: the $300,000 Pimlico Special (G3) with Shaman Ghost ($2.80) and the $100,000 Hilltop Stakes with Happy Mesa ($9.60). Unplaced in the Adena Springs Miss Preakness (G3) and the Black-Eyed Susan (G2), Castellano was second in yet another stakes at the end of the Friday card, the $100,000 Skipat Stakes aboard Summer Reading. He won the first stakes race on the Saturday Pimlico card, the $100,000 The Very One with Everything Lovely ($7.80) and returned to finish second in the $200,000 Chick Lang Stakes aboard Aquamarine. His other mounts in all but one carded stakes race included a third-place finish in the Maryland Sprint (G3) and a fourth-place finish in the Longines Dixie (G2) before his Preakness victory. The four-time Eclipse Award winner for Outstanding Jockey led all North American jockeys by total earnings last week with $1,487,916 earned. He started in 29 races and finished with seven wins, six second-place finishes and four third-place finishes for an in-the-money rate of 59% and a win rate of 24%. Castellano also led by total number of stakes starts, wins and earnings, winning $1,321,000 in four wins of his 13 starts in stakes races during the week. This entry was posted in People and tagged Chad Brown, classic empire, cloud computing, everything lovely, happy mesa, hill 'n' dale, hilltop stakes, jockey of the week, jockeys guild jockey of the week, jockeys' guild, jockeytalk360 jockey of the week, julien leparoux, pimlico, Pimlico Special, preakness, Preakness Stakes, shaman ghost, skipat stakes, summer reading, the very one, Triple Crown by Press Release. Bookmark the permalink.